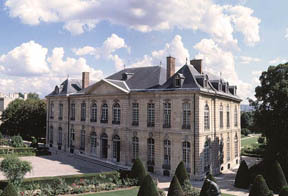 One of my favorite museums in Paris is the Musee Rodin, adjacent to the Invalides complex on the Right Bank. Opened in 1919, the museum is dedicated to French sculptor Auguste Rodin and includes more than 6,600 sculptures, 8,000 drawings, 8,000 photographs and 7,000 other objets d’art (although only a small fraction are on display at any one time). The museum is housed in the 17th century Hotel Biron—a glorious mansion in which Rodin rented four rooms for his workshop from 1908 until his death in 1917—and the manor’s enormous gardens. Rodin donated his entire collection of sculptures to the French government on the condition that the Hotel Biron be turned into a museum upon his passing. 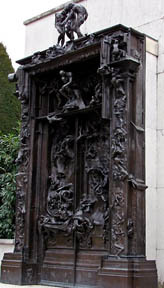 Among the many pieces displayed at the museum are three of Rodin’s most famous works, including Le Penseur (The Thinker), Le Baiser (The Kiss) and La Porte de l’Enfer (The Gates of Hell). There also are a small number of pieces by Claudel, Monet, Renoir and Van Gogh on display as these were privately owned by Rodin and bequeathed to the museum upon the artist’s death. 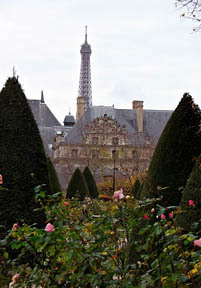 Although many of Rodin’s works are displayed inside the Hotel Biron, my favorite part of the museum is the perfectly sculptured garden behind the mansion, which provides stunning views of the Eiffel Tower and the nearby Dome des Invalides church. 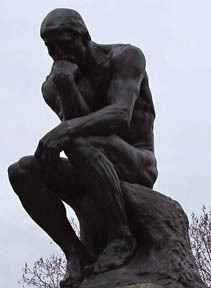 Perhaps the best known of all Rodin’s works, The Thinker, is ensconced here in a tree-lined courtyard near the back of the museum, while The Gates of Hell is located at the western edge of the green space. 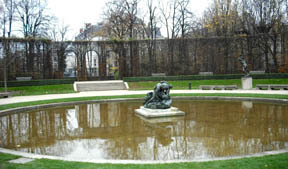 At the far end of the garden is a large, circular pond, ringed with many of Rodin’s pieces. And all through the large ornamental garden are carefully clipped hedges, rose bushes, flowering plants, trellises and carefully placed park benches for lengthy ponderings of Rodin’s sculptures. The Musee Rodin is located at 79 Rue de Varenne, and is open Tuesday-Sunday from 10 a.m. to 5:45 p.m. (8:45 p.m. on Wednesday evenings). Admission to the entire museum plus any temporary exhibits is 9 euros; admission to all but the temporary shows is 7 euros; garden-only admission is a steal at 2 euros. The nearest Metro station is Varenne. This entry was posted in Art, Beauty of Paris, Museums, Right Bank and tagged art, Auguste Rodin, Invalides, Musee Rodin, museums, Right Bank by Bob Adams. Bookmark the permalink.